B-24 Bomber Pilot, Evader, and POW. The 8th of May marks the 74th anniversary of Nazi Germany’s unconditional surrender to victorious Allied forces. On that day in 1945, World War II in the European Theater of Operations was officially over. Until recently, World War II has been receding further and further into the pages of history. Fresh first-hand accounts of those years are becoming rare indeed. 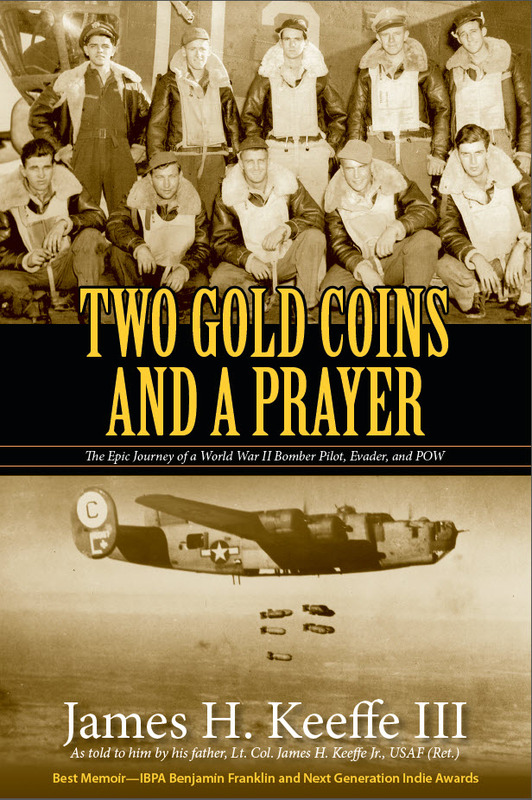 Told by a man who was there, Two Gold Coins and a Prayer: The Epic Journey of a WWII Bomber Pilot, Evader, and POW plunges the reader instantly into the air war over Germany and unveils a tale of vast proportions. Thankfully, there is a renewed and growing desire to know more about World War II, not only by the grown children and grand children of war veterans here in the United States, but also by the younger generation in European countries that were forced to bear the heavy yoke of vicious Nazi occupation. Their curiosity to uncover the stories and to pay tribute to the Allied airmen and soldiers, and to the men and women of the Underground organizations — who risked everything for freedom– is truly heart-warming. Two Gold Coins and a Prayer is timely; to honor not only my father, but also those who at great peril to themselves and their families helped my father.